In recent weeks protests have turned to riots in China's Sichuan province home to a large number of Tibetans who say their human rights are being suppressed. But the situation could become far worse should their spiritual leader, the Dalai Lama, dies. 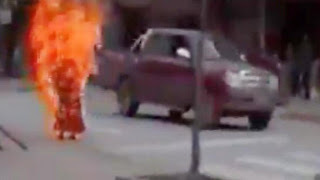 At least 16 monks or nuns have set themselves alight in protest against Beijing's grip on ethnic Tibetans many of whom seek the return of the exiled Dalai Lama and freedom for Tibet. Several have also been shot dead by police during riots which have been blamed by China on separatists. Authorities have cut Internet connections and shutdown mobile networks across the region in an attempt to prevent the protests spreading. Foreign news crews and journalists have also been barred from visiting the area to limit the reporting of the worst violence seen since 2008 when rioting ravaged Lhasa, the capital of what China calls the Tibet Autonomous Region [Wikipedia]. The ban on foreign journalists has helped keep the subject off the news agenda. While print media has covered the story, many news broadcasters have made scant mention of the protests. The BBC have reported the skirmishes on their website, referring to the killing three protesters in late January [BBC] and the tightening of security [BBC], but there have been few television news reports. The Sky News website fails to even mention the ongoing troubles. Al Jazeera has also failed to report on the turmoil and France 24 published only a short article on January 25th. Russia Today only published a few lines on the subject while Iran's Press TV ignored the news altogether. CNN made the best effort in trying to report the riots, sending its correspondent Stan Grant to the towns ripped apart by the rioters. The website had already covered the troubles, but in an effort to get close to the story the CNN crew made the journey into a province in lock-down. His three and a half minute report was repeated on air many times throughout the week. But it nearly did not make it to the edit suite. Grant and his crew were detained for five hours at the airport and some of their footage was seized. Speaking after his visit, Stan Grant explained the difficulties in getting into and even out of the area [CNN] while there was further coverage on the website itself [CNN / Timeline and more videos: CNN]. In China itself CNN's broadcasts have been blacked out, censored by the state machine. Meanwhile its own media have controlled how and what is reported. The Global Times English language website reported on how ordinary citizens had been targeted by the rioters. Xinhua has not mentioned the riots on its English portal and it was not possible to find any articles on Chinese language news websites. Censors have also worked hard to eradicate any mentions of the riots on Chinese microblogs. Netizens posted photographs on Sina Weibo showing army trucks heading towards Tibetan regions of China's Sichuan province but these posts were soon deleted [NYT / RFA]. Pictures and video of the self-emoliation have also emerged though due to their graphic nature many news organisations have refrained from showing them. It is likely that the latest series of protests and riots will be kept down, but authorities may face further dissent in coming years and especially after the Dalai Lama dies. The Dalai Lama has generally managed to restrain Tibet's youth with his message of non-violence, says Khedroob Thondup, nephew of the Dalai Lama and a former member of the exiled government. Speaking to Reuters he says that this could soon change. "Positions have hardened," Thondup claims. "If His Holiness were to suddenly leave the scene, yes, there will be many more problems for the Chinese government." It is a view expressed by many others. Nicholas Bequelin, a researcher with Human Rights Watch, says the Dalai Lama's death could precipitate chaos in Tibetan regions. "Were he to pass away in exile abroad, it could spark an unpredictable wave of protests far greater than 2008 and an even harsher crackdown," Bequelin suggests. It is a frightening prospect for Beijing who seem unwilling or unable to accept there are ethnic divisions and issues affecting the rights of Tibetans and other ethnic groups. A wider civil disturbance amongst Tibetans could spark trouble in other regions. Xinjiang is a potential powder keg and saw widespread disturbances in 2009 [Wikipedia]. Friction between Han Chinese, which account for more than 90% of the country's population, and different ethic groups differs depending how willing the group is to integrate. In Yunnan there is little if any conflict between different groups. The province is home to more minority peoples than any other region in China, making up some 34% of the population. But in some areas the indigenous ethnic group has felt invaded or sidelined my the Han Chinese, resulting in social or physical conflict. Prejudice even exists between the Han Chinese themselves with people from one province looking at others with disdain [How the Chinese see each other / Beijing map / Hong Kong map / Shanghai map]. There has been a barrage of insults between Hong Kong residents and Beijing recently, and while somewhat tongue in cheek it underlies the prejudice existing between different parts of the country. In the past few days Hong Kongers called mainlanders 'locusts' in an advert taken out in papers which criticised the "mainland mothers" who were "flooding in to take up resources in public hospitals, getting benefits and social welfare" [BBC / China Daily / Xinhuanet - Chinese]. The advert came less than a month after Peking University professor Kong Qingdong called Hong Kongers "bastards" and "running dogs of the British" on a live webcast on the mainland [Guardian / YouTube / Full video: Shanghaiist]. The war in the blogosphere continued with one mainlander blogger Cheng Jianghe [程江河] suggesting that Qingdong had successfully predicted the attitude of the Hong Kong people. With such scorn and criticism being hurled about it appears Chinese leaders have more than just Tibetans and Uighers to worry about.